How Will My Wrap Arrive and What Will I Receive as Part of My Order? One of the most common questions we hear from customers following the design process is ‘What will I actually receive when I place an order with you?’. This question is not referring to the how their lacrosse helmet wraps will look. Every order goes through a thorough design process where our sales and design departments work with the customer to ensure their wrap looks perfect. Design proofs that illustrate how the helmet wrap will look on a helmet have already been approved. The question is rather about the materials, layout, and packaging. Each helmet wrap is a custom-printed decal sheet that contains all the individual pieces needed to wrap a helmet. The number of individual decals included on the sheet varies depending on the helmet model the template is designed to fit. Warrior helmets typically have fewer, but larger pieces, while Cascade helmets typically have a greater number of smaller pieces. We know how important it is for a team to appear UNIFORM. Wraps template vary due to the inherent design differences between the various helmet manufacturers and models. Despite these differences, we take great pains to ensure each helmet looks consistent regardless of the helmet model. Furthermore, JackWraps® does not charge extra for multiple different helmet models as long as there are a minimum of 15 total wraps ordered. JackWraps® helmet wraps have been tested with great success at all levels of completion—from youth to professional. Our wraps are made from the same 20-mil. thick material widely considered to be the easiest to apply and the most durable. This is the performance major NCAA teams nationwide have come to expect. You won’t find a tougher wrap material on the market, so you can be confident you are buying the best wrap material available for your team. JackWrap® sheets arrive individually packaged in a custom box. These boxes are labeled on the outside with the helmet make and model. This helps make it easy for coaches to quickly get the right wraps to the right players. Once the box is opened, you will find that the decals sheet is again labeled with the helmet model as well as a clear label on each decal piece helping to make application a snap. 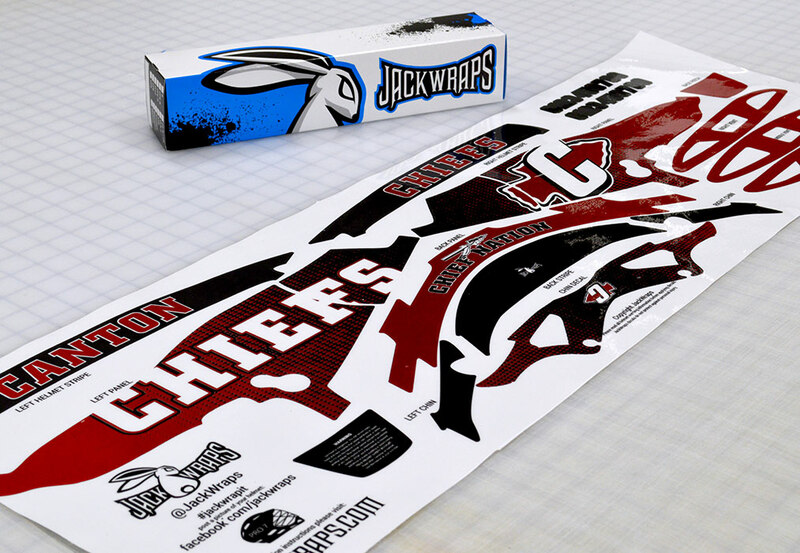 JackWraps® specializes in custom lacrosse helmet wraps, but also offers a full range of lacrosse helmet decals from traditional side decals and stripes to custom packages. Reach out today to speak with one of our reps. We would be happy to get started on a custom design and quote for your team.